ww2dbaseAfter several years of testing, on 3 Aug 1933, United States Army's Springfield Armory's weapon designer John C. Garand received official designation "M1" for his prototype semi-automatic rifle design T1E2. In May 1934, 75 of them went to field trials; 50 were given to the infantry, and 25 to the cavalry. After initial problems were addressed, the M1 Garand rifles were ordered in large numbers. Initial production difficulties meant the first delivery was not done until Sep 1937, but by the time the European War began in Sep 1939, 100 rifles were made each day. By 10 Jan 1941, 600 rifles were being built per day. By the end of the year, the US Army considered its ranks fully equipped with M1 Garand rifles. The M1 Garand rifles were semi-automatic, meaning that although each trigger pull resulted in a single round being fired just like their bolt-action contemporaries, between each shot there was nothing that needed to be done in order to load the next round. This design allowed the Americans the ability to fire more shots against their German and Japanese counterparts, who continued to use bolt-action rifles as the standard infantry weapon. Another advantage of the design was the rifles' simple construction. In the field, a soldier could disassemble his rifle using only a rifle sound, therefore allowing him to easily clean and maintain his weapon between engagements. General George S. Patton referred to the M1 Garand design as "the greatest implement of battle ever devised." The M1 Garand rifles were clip-fed. When the last round of a clip was fired, a metallic pinging noise was made as the clip was ejected. The sound would become an unique characteristic of these rifles. In 1943, the British Army tested M1 Garand rifles as a possible replacement for the Lee-Enfield No. 1 Mk III rifles, but rejected it after concluding that the design did not meet British demands. After WW2, M1 Garand rifles continued to serve the US Army in the Korean War. Many M1 Garand rifles, especially after they were phased out in the 1950s, were exported to friendly nations, including post-war Germany, Italy, and Japan. In 1963, a small number of them were still in use during the Vietnam War. The last standard M1 Garand rifle was retired from the US Army in 1965, and the reserve and National Guard units continued to use them into the 1970s. The best infantry weapon of ww2 you have 8 rounds of 30.06 ammo, but the only bad point, when you have fired off the last round, the magazine also flies out, and if it hits hard ground, or rock you hear a ping!! meaning the enemy knows your out of ammo. Some G.I. 's would fire off a few rounds, and drop a empty magazine on the ground when the enemy stuck his head up, you shot him! Data: Caliber 0.3in,Cartridge 0.3-6in,Firing rate 30 rounds per minute,Magazine 8 rounds,Range 656yd. The M-1 Grand was a gas operated, shoulder fired semi-automatic rifle. Germany's answer to the American M-1 was the Walther Gewehr 43 It was a gas operated, magazine fed, semi-automatic, shoulder weapon. The weapon was able to take a 10-round or 25-round box magazine, caliber 7.92mm. An even simpler design known as the Karabiner 43 was issued, both weapons could use the telescopic sight and mount fitted as standard issue. After World War II many countries in Europe used German weapons The Czech Army used the Gewehr 43,for many years. The MP 44 Sturmgewehr, or Assault rifle designed by Hugo Schmeisser,used the 7.92mm short cartridge it was gas operated, used a 30 round box magazine. The MP 44 was reliable, easy to field strip.The MP 44 was the first rifle of its kind, and was the predecessor of all assault rifles to follow. A total of 424,000 weapons were produced. After W.W.II the rifle was used by East Germany and the Yugoslav Army, some weapons have surfaced in Africa, Middle East and Asia. The Russians also had a service issued Semi- Automatic rifle the SVT-38 the SVT stands for "Samozaryadnaya Vintovka Tokareva". Over 5,700,000 rifels were produced during World War II. The weapon used the 7.62x54mm cartridge this was about equal to the U.S. 30.06 in the M-1 Garand. After World War II the rifle was issued to second-line units, Soviet allies, while others were kept in storage well into the 1990's. Later many Russian Surplus Military Rifles were sold abroad, among them were the SVT-38's. The SVT-38:is a semi-automatic,gas operated, magazine fed, shoulder weapon that used the full powered 7.62x54mm cartridge. The rifle could use Mosin-Nagant 5 round box magazines when necessary. The SVT-38 was designed to use a 10 or 20 round box magazine. During World War II the Russians and Americans, were the only countries to issue semi-automatic rifles in large numbers to its front-line troops. The German's had semi-auto Walther Gewehr 43 Karabiner, but it was a limited issue weapon and most German troops were using the bolt- bolt action K-98. I can guarantee the enemy will NOT know you are out of ammo when the clip is ejected out of the magazine. It's IMPOSSIBLE to hear a ping in the heat of battle. Keep in mind there are hundreds of rifles being fired, machine gun fire, hand grenades going off, artillery, rockets, and tanks firing their main gun. Do you really think the enemy is going to hear a ping ????? If you do you have never been in real combat. auburn 5978 7 Feb. 2010 11:40:04 AM The M-1 Garand eight round clip ejecting did leave a audible ping on hard ground or rock. However, for the enemy to hear such a sound this is only in theory, plausible explanation a guess or opinion. I have fired the M-1 and the ejecting of the clip, after the last round has been fired, does indeed have a very distinctive sound. Hell you can even throw a rock, and hope the enemy will fire in that direction. Conditions for such a ploy: Locate enemy position Reconnaissance by fire this is exploratory survey of enemy territory, or other clever maneuver. Flush out a sniper position,yuo just have to use your experience. Surprise an enemy into thinking he has for the second the upper hand. GI's will always improvise, hell one can even throw a rock toward a suspected position, or just use your gut feeling! If you have never experienced war, or what it can do to a human being its hard to put into words. Only thing I know the millions of men who experienced war, there are millions of stories, and some sound unbelievable, but one can not say such things have never happened. auburn 5978, I spent from 1967 to 1970 in South Vietnam, and I have seen combat, I've seen things that I never would have believed possible. I have a friend, who is in a VA Mental Hospital to this day. I knew a man, who served with the 1st. Inf. Div. and when he came up to the top of the hill, who did he meet, it was a face to face with Charlie both were surprised, and both kept walking they were soldiers trained to kill, but they weren't going to kill that day. Damm I met Charlie in a bar they were on R&R bought them some beer, and went about my business. The M-1 was used in large numbers until 1963 and as late as 1966 by the US Army. Some U.S.Army Reserve,National Guard and U.S. Navy units used the M-1 into the 1970's. It fired the .30-06 / 7.62x51mm round, feed system 8 round clip internal magazine. The ejection of an empty clip, created a very distinctive metallic "pinging" sound. In World War II, reports arose in which both German and Japanese infantry were making use of this noise in combat to alert them, that US Troops were out of ammo, in order to get the drop on them. This information was taken seriously enough that the U.S. Army's Aberdeen Proving Ground started experiments with clips made of other material like plastic However, no improved clips were ever adopted, as far as I know. During World War II over 5,000,000 M-1's were produced. After W.W.II many NATO and other armies used the M-1, the Greek Army used the M-1 into the 1990's. Continued from #7 auburn 5978 Feb 7, 2010 "Hitler's Buzzsaw" The MG 42 Maschinengewehr fired 7.92x57mm mauser round. Rate of fire between 1,200 to 1,500 rpm. This weapon made a very distinctive sound over 750,000 were built. It could be used as a heavy or light machine-gun, it could also double as a light support weapon w/folding bipod be belt fed, or use a detachable drum magazine. Prolonged firing could over-heat the barrel and crews were trained to replace the barrel within the shortest time in seconds. 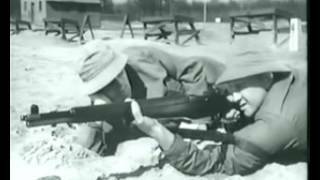 The U.S.Army, even made a training film to teach GI's how to combat the MG42. American troops would take cover, and assault the position only during the few seconds it took the crew to change the barrel, but that's the theory. Five Germans armed with two Pistols, four K-98 rifles, maybe one MP-40 and some stick grenades. That's about 68 rounds, and hoping the MG42 is not back in battery. The GI's,ten men armed with eight M-1 Garand and one M-1 Carbine and one BAR,that's about 99 rounds firing towards the German position who would win? and don't forget the GI's hand-grenades. Just theory, or a plausible explanation. To make this story short, the GI's could have called Division Artillery on the German position and hope the rounds, don't fall short. Have you even seen what 105mm,155mm Howitzer shells do to people and equipment, I have. Did events listed above ever happen? maybe, maybe not, but some GI's did knock out those German machine-gun positions. I'm sure they are listed under "Small Unit Actions" During World War II in the U.S. National Archives. Under History of the U.S.Army in World War II. After WWII surplus weapons flooded Europe many countries used both the MG34 and MG42 for years afterward. One of the last production versions the M-53 was used by Yugoslavia until 1999, and were sold to Iraq in 1980. Some armies still use versions of the MG42, that were produced in their own countries today. Bill, quit living your life through other people, I doubt you were ever a Soldier, and as such, you listen to peoples stories, which are usually embellished. I, and all of my Soldiers that have seen combat, never talk about it, because it is what it is. Scott 22 May 2010: I don't think, that I'll even hear from you. As I say to Darlin, one of my Chihuahua's "You Got The Nerve!" In my youth, I would have felt insulted, or went home and put my head in the oven! but I have my integrity. For Scott, May 22, 2101 # 12 Continued from # 19 Tech. Sgt.Russell Dunham's combat action,took place on Jan.8,1945 on hill 616 near the town of Kayserberg on the Franco-German border. Sgt Dunhan used his .30 M-1 Carbine,he fired 175 rounds of ammunition, and used 11 hand grenades, to take out those (3) German machine gun positions. After World War II,Sgt.Dunham worked for the Veterans Administration for 32 years as a benefits counseler in St Louis, Missouri until he retired in 1975. Russell Dunham was born in East Carondelet, Illinois on Feb. 20, 1920, He died in 2002 age 89. Because of Sacrifices made by heroes like Sgt. Dunham, we live in the Greatest Country in the World. By the time WWII ended over 4,000,000 M-1 rifles had been produced. Many were later transferred to Allies and friendly nations. When the US went to the aid of South Korea in June 1950, the Army was short M-1s, Springfield Armory and other manufacturer's started to produce the weapon to meet the Army's needs. The last M-1 rifles were produced by the Harrington & Richardson Co. in 1956. H&R contimued to making parts for the M-1 and later converted 50,000 M-1s to 7.62mm (.308) for the US Navy. One World War II poster said it all, with a GI saying "My M-1 Does my talkin for me". I proudly own two WWII serial numbered SA M1 Garands, thanks to the CMP. They shoot only as well as I can aim, of course, but they are a joy and always a point of interest by others at the range. I bought one for my father's retirement as he carried one with the Army back in the early 60's. Both my granddads served in WW2 one was a Military Policeman 3rd Service Command, other was 82nd Airborne 505th P.I.R./ R.C.T. Both loved the M1 Garand and Carbine, told me so. Dad was in Nam 68-69 with the "Big Red One" was a E-6 (staff sergeant) he ran LRRP patrols in the Central High Lands he hated the M-16 ha still does! But loves the M-14, but in Nam carried a M-79 said unlike the jam o matic M-16 the M-14, M-79 NEVER failed. But he said all the guys in his platoon loathed the M-16s and chucked them first chance they got and carried M-14s or even AK47s. Said some nitwit claimed you could carry more m-16 ammo than the M-14 and the guns were lighter, well according to my dad you needed twice the ammo to do what one round of 7.62 would do. And he claims where there is a ton of M-16s in the rice paddies and jungles of Nam becuase troops hated them and chucked them there. Is there a way to determine where, or if, a Winchester Garand made in July 1944 was used or shipped to. The rifle now has a Springfield Armory barrel stamped January 1950. Did the rifle go to Europe? the Pacific? Korea? Or never left the US? I have a M1 Garand with a serial #636. How can I track where it served. The Caliber is more accurately written as ".30-06" pronounced "thirty awt six"
Hello my name is allen settles i live in anderson county tn my grandfather was i ww2 his name was sam Presley he lived in Elizabethon tn , i was hopen an pray that you all chould help me try an find his actual rifle that he used in the war he passet away. 1991 an it whould make the family so happy if i chould find the rifle that he used in the war, thank you an have a blessed day. Hi my grand pa turns 94 in march and i was wondering does any one think its possible to find his M1 that he had when he was in the army. if so where would i start..